Why using for Fasm project masm lib ? For Fasm not needed masm lib ! No need to use masm libs for FASM, EXCEPT for visual projects. The visual project is an Easy Code feature that needs to link the Easy Code visual libraries. Since FASM does not have a linker, the Microsoft's linker is used instead and it needs the masm libs to be able to link. So in a FASM visual project, all windows and/or modules are compiled with FASM and then linked with the Microsoft's linker. Any other project type not being a "Visual executable type" DOES NOT USE any other tool than FASM. The issue that happened when running EasyCode from the Command Prompt has been solved. It will be fixed for next versions of Easy Code. When running 'EasyCode.exe' from the Command Prompt, the "e" message was displayed. The 'CommandLine' member of the 'App' object ('App.CommandLine') could contain a wrong command line (which caused the bug documented in the previous line). Easy Code's splash screen and about box dialogs now display the correct Windows version even when running in compatibility mode. When trying to add a RichEdit control to a project, Easy Code could not create it and an error was fired. When a procedure, a macro, or a structure was added, the 'Properties Window' might show some empty lines (only in FASM projects). The default classic project created by Easy Code (both, 32 and 64-bit), fired an error and could not be built (only in FASM projects). When adding an object ('Button', 'Edit', etc.) to a window, Easy Code could crash (only in FASM projects). Now Easy Code can open individual '.asm' files without having to create a project. Macros in FASM projects did not work well and could fire errors at compile time. The problem has been solved, but for Easy Code to work properly you also have to make changes in your 'Fasm.cfg' and 'Fasm64.cfg' as specified in the 'Fasm.txt' file. The FASM 'struc' keyword was not recognized by Easy Code. The problem has been solved, but for Easy Code to work properly you also have to make changes in your 'Fasm.cfg' and 'Fasm64.cfg' as specified in the 'Fasm.txt' file. The text sent to the compiler can be encoded to UTF-8 (without B.O.M.) for all configurations. New 'msvcrt.inc' and 'msvcrt.lib' files for 64-bit applications (the 'msvcrt.inc' file is not yet completed, but most useful functions are declared). Now you can copy/paste controls among different instances of Easy Code 2. The 'HiDWord' and 'LoDWord' macros has been optimized for all assemblers. New 'uxtheme.inc' and 'uxtheme.lib' files related to XP Themes (Windows XP and later). When creating a new FASM project the 'WIN32AX.INC'/'WIN32WX.INC' or 'WIN64AX.INC'/'WIN64WX.INC' include files could not be properly set in the Project Explorer. Happy new year and enjoy Easy Code! The 64-bit 'ECService' example for GoAsm built fine but did not run (the Manifest file was wrong). The 64-bit 'FindCollectionExactItem', 'FindCollectionItem', 'SetAlign', 'SetScrollBars', 'Update' and 'WriteTextLine' methods had bugs and did not work fine (just for the 64-bit visual libraries 'ECLib64.lib' and 'ECDll64.dll'). The default procedure for a 'DialogBox' object did not include the 'WM_INITDIALOG' message. A wrong value in the BITMAP structure of the 'gdi32.inc' file affected to 64-bit projects. The missing API function 'CreateDirectory' has been added to the 'kernel32.inc' file. easycode project is open source right? No, it's not open source. Easy Code x64! A new 64-bit executable file ('EasyCode64.exe') has been added to the '\EasyCode\Bin' folder. 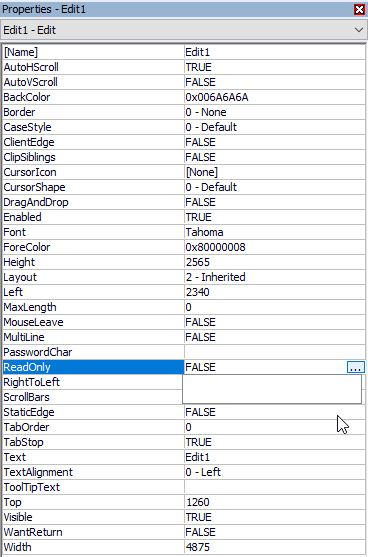 From now on Easy Code will include both, the 32-bit ('EasyCode.exe') and the 64-bit ('EasyCode64.exe') releases. They both use the same auxiliary and configuration files, so you can run any of them without having to make any change. Improves the 'Find Unused Resources' option. The 'TVI_ROOT', 'TVI_FIRST', 'TVI_LAST' and 'TVI_SORT' constants were not well defined in the 'comctl32.inc' file. Fixes some issues affecting to 'Accelerator' resources. Removes alignment for MCI structures and fixes a pair of bad declared structures fot 64-bit projects ('winmm.inc' file). A new 'Settings.exe' file allows you to associate the Easy Code files to the 32 or the 64-bit executable. Fixes some errors of the FASM 64-bit macros ('ECFasm64.asm'). Fixes the issues that appeared when some windows were undocked from the IDE. "MultiLíne" Edit controls flickered when moving the mouse pointer over them (visual projects only). The 64-bit 'GetCPUInfo' method did not work fine. Resources did not compile correctly when text encoding was set to UTF-8. 1. A new option in the 'Abut' menu, 'Check for updates', allows you to check whether there is a new version of Easy Code (programmed by Héctor A. Medina). 2. New 'wininet.inc' and 'wininet.lib' files for 64-bit projects. 3. A new option in the "File" menu ("New File...") allows to create new include or miscellaneous files. 4. The 'Readme.txt' has been renamed to 'WhatsNew.txt', so you should remove the 'Readme.txt' file from the 'EasyCode' folder. 1. Fixes a bug that could make Easy Code to crash when using specific keys combined with the "Function" key (Fn), which generate the WM_APPCOMMAND message. 2. Fixes a bug that made 64-bit Easy Code not to work on Windows XP-64 and Windows Vista-64. 1. Include and library files have been improved to cover API functions up to Windows 10. 1. The Easy Code 'STBPANNEL' structure was bad defined and affected to the 64-bit 'StatusBar' controls having several parts (some parts were not shown). 1. Fixes a bug in the 'IO_STATUS_BLOCK' structure of the 'ntddk' file that could fire a blue screen when running 64-bit drivers built with Fasm and/or GoAsm. 2. Fixes a bug in the Easy Code 64-bit visual libraries that affected the 'DeleteRegistryKey', 'DeleteRegistryValue', 'GetRegistryValue' and 'SetRegistryValue' methods (they did not work). 1. A new option in the 'Editor' tab of the 'Settings' section ('Right margin:'), allows a vertical line to be drawn at the specified column. 2. A new method, 'OutputBuffer', saves a buffer in a binary file. For more information, please see the 'OutputBuffer' method in the Easy Code help file. 1. The 'Hide selected text' option, in the 'Editor' tab of the 'Settings' section, did not work when it was unchecked. I got an issue when editing the Functions, more specifically when it's about setting something to TRUE or FALSE. It shows a BLANK, I can't select anything. Using the newest version in English.